DIMMER Dot is a variable auto transformer that provides continuously adjustable ac voltage. In its ‘auto transformer’ form, the Dimmer Dot is an efficient, reliable method of controlling ac voltage from zero to line voltage by amplitude modulation of the ac waveform. 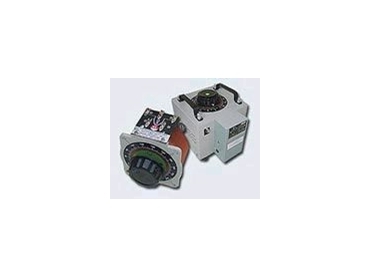 The Dimmer Dot Variable Auto Transformer is available from Australian Rectifiers Pty Ltd . Since the current, power, heat, light and motor speed are further functions of the voltage, the Dimmer Dot Variable Transformer finds its varied use, but is not designed to provide ac mains isolation. The transformer consists of a single-layer winding, on a toroidial silicon-steel core. As the control knob is rotated, a carbon brush traverses the winding, tapping off a portion of the total voltage across the winding. The brush is in continuous contact with the winding, and the voltage between turns is always less than 1V even in the largest model. In the smallest model it is only about 0.3V. The discrete voltage increments obtained as the knob is rotated are always less than the voltage between turns. Since the brush spans more than one turn, the change in voltage is practically continuous. The brush is designed so excessive heating cannot occur in the turns that it spans. Dimmer Dot has many operating advantages over any other manually operated voltage control devices for alternating current use. The transformer includes good regulation output voltage, which is substantially independent of load; smooth control; it can be set very closely to any output voltage within its range; and high efficiency (greater than 96% efficient) with very low losses under all load conditions. The transformer is created for long life, with the use of exclusive Dura Dot contact surfaces , the life of the Dimmer Dot Variable Auto Transformer is essentially the same of any standard fixed-ratio power transformer. Output voltage is continuously adjustable from 0-112% of line by approximately 340°. The dial reads directly in no-load output voltage at rated line voltage or some dials are calibrated for percentage of the full range control. * Lower input current input power consumption is proportional to output, unlike the electronic Thyristor controllers, which still maintain high input RMS currents. The Special Voltage Range Dimmer Dot is available in standard single phase 240V and three phase 415V 50Hz. Other special input voltages can be supplied. Two phase models are also available. The transformers come with a warranty of twelve months from date of purchase.